Laurel Leaf Library, 9780385735926, 273pp. Star Beck is super-duper megastar famous. She rocks literally every night in concert for thousands of cheering fans. But the pop star life tour buses, fauxmances, size 0 minis is getting a little old. Star can t help wondering what it would be like to be a regular girl without paparazzi trailing her every move, and without people being nice just because, well, she's Star Beck. And when she discovers that her mom has been lying to her for years about something very important, Star decides to find out what the world beyond her stage is like after all. In the blink of an emerald green eye, Star finds herself . . . buying a car. Eating cheeseburgers. Swapping her stilettos for flip-flops. Getting a job that doesn t require dancing, winking, or mall appearances. And falling for the cutest, realest boy she's ever met. 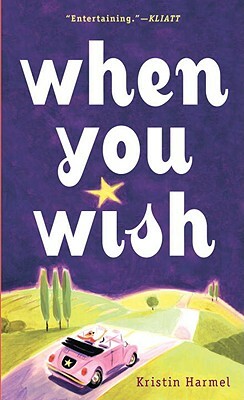 "When You Wish "is Kristin Harmel s first novel for teens; she s also the author of three novels for adults, "How to Sleep with a Movie Star," "The Blonde Theory," and "The Art of French Kissing." She lives in Orlando, Florida." "A teen pop star goes from working red carpets to waitressing in Harmel's first novel for young adults." "[T]his entertaining book comes down to earth when Star feels compelled to learn what it's like to be 'normal.'"